If I mention I like something around the holidays, I often get over indulged. Biking for example. Everyone who bought me a gift gave me a bike related book. One coworker gave me a book of 1001 tips on riding a bike. I accepted it graciously because it was thoughtful, but something suited for a novice. 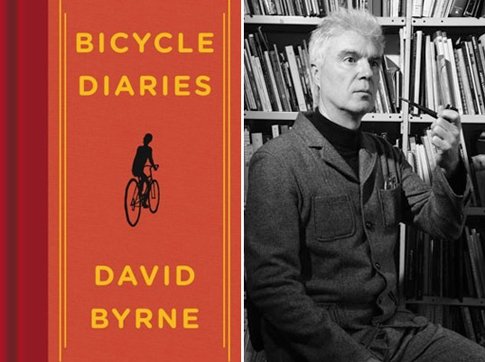 My sons got me bike books, one of which I really enjoyed and was written by David Byrne of Talking Heads fame. We heard a bang outside and the dogs began going nuts. I though it may have been a car accident till wifey said it sounded like someone slammed the breezeway door. I look out the window and saw and unconscious hawk on our porch. He soon recovered but remained there dazed for around 30 minutes. I was able to get withing a couple of feet for this photo. I decided to ride the SS to the market. 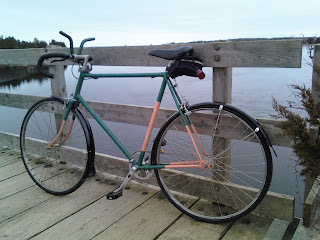 It still didn't feel right even with the bar ends installed in the "bar middle". I went for a short few miles repositioning the end and settled on a relatively upright position. The bike is still not quite right and I'm thinking a new saddle may get it to an acceptable comfort level. It's something to do on a chilly 35 degree Sunday afternoon. Ride to the ocean, yea....that's the ticket. It's not pink, it's Salmon colored. 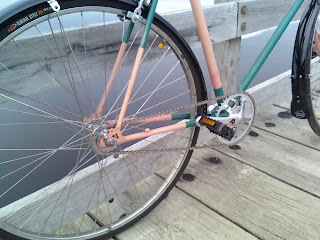 The barend shifters look really odd there, but if they help, so be it. Interesting setup on the handlebars. 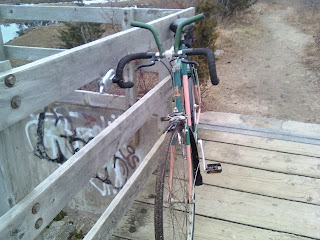 One of the owners of the LBS nearby rides a bike with flat bars and put dropped bar ends on it, but curled them up instead of down, giving hand positions almost like north road or tourist bars. I guess if you own the bike shop you can do whatever you please. I was interested in the David Bryne book....heck if you like it....I should like it. I don't mean this in a bad way, of course! Societal concerns aside... I just hope that as the price of memory falls, the possibility of uploading our brains onto a digital medium becomes a true reality. It's a fantasy that I dream about almost every day. Bicycle Diaries looks good. I'll put it on my to-read list. Thanks. You didn't tell me about this bike! pssst...it's still pink. It's pretty though!